IELTS App Review: IELTS Writing Model and Sample - FREE by Impact Learning Ltd.
Having a hard time practicing your writing skills? Do you need to have it improved for a specific English proficiency examination? Then, here is a great app for you. IELTS Writing Model and Sample by Impact Learning Ltd. is a great app for those candidates preparing for the IELTS or the International English Language Testing System examination. Take note that the IELTS examination has different modules: the Academic Module and the General Training Module. The listening and speaking sections of the test on both modules are the same except for the reading and writing sections. The best thing about this app is that it both caters the Academic and General Training module writing tasks. Let’s look closely on the features of this app. This app has got a simple interface. It has a cool view to the eye – neither too tacky nor simple. On its home area, you will find different options on your writing training. You have the Academic Module and the General Training Module. Each module has different set of exercises that will surely amaze its user. In addition, there are some IELTS FAQs in this app for additional information on the IELTS examination. For those taking the Academic module, the two asks have different activities you can practice on. 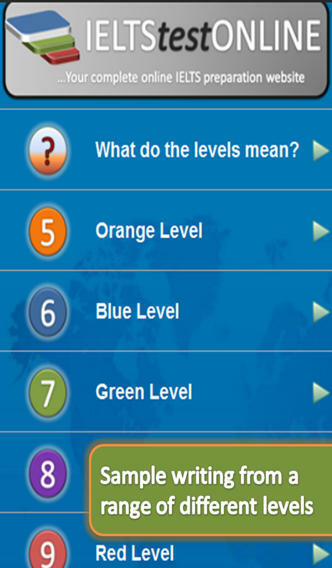 The activities are ranked on different levels. Start with the orange as it is for beginners. However, do not be deceived for the questions are still pretty challenging in this level. For the first task, graphs and charts are already included in the question. With just a simple tap on your gadget, the chart pops out. The question is below. Two sample answers are provided for users to check. However, it is best if you write your own answers first before checking the sample answers. Make the sample answers a point of comparison not a model for your own answer. Sample question for the second task. Still, sample answers are provided. In addition, you can adjust the font size in this app. If you have problems reading small letters, you can have them bigger in your own comfort. The best thing about this app is it is for FREE! Furthermore, this app is available in both iOS and Android platforms. You can have this app downloaded at https://play.google.com/store/apps/details?id=com.ieltstestonline.com.writingsampleandmodelfree and at https://itunes.apple.com/us/app/ielts-writing-model-sample/id638538148?mt=8 . Also, you can simply download them at the App Store and Google Play by simply typing IELTS Writing Model and Sample. Install this app now and start developing your writing skills.